Offer your prayers to Goddess Lakshmi and Kamadhenu on Gho Ashtami and receive their blessings. There are certain days when the specific energies are at their peak. November 19th IST is one such day when the wealth vibrations will be at its best. This day is called Gho Ashtami. 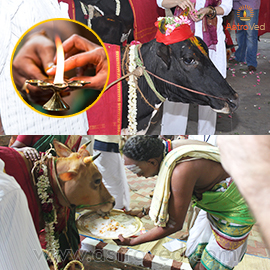 Worshiping the cow during Gho Ashtami brings good luck and prosperity to you and your family. 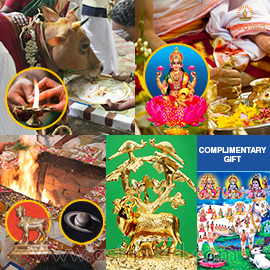 As the cow holds the holy trinity and all celestial beings within it, it is a great time to please them by performing sacred rituals associated with the cow. Goddess Kamadhenu is a divine cow who can fulfill all your desires. It is a great time to please her by performing sacred rituals associated with the cow. Cow is the living cosmos and whatever we feed it goes to all the celestial beings and Gods. Offering your prayers to this 8 inch energized Kalpavriksham with Kamadhenu statue will help you receive the blessings of the divine cow, Kamadhenu and Kalpavriksham. Kamadhenu is the divine cow which has all the Gods and Devas residing within her and She has the power to grant you anything you desire. Kalpavriksham is a wish fulfilling divine tree and emerged along with the divine cow Kamadhenu during the churning of ocean by the devas and asuras. 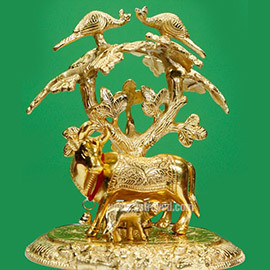 Order your energized 8 Inch White Metal Gold Plated Statue and receive the blessings of Kamadhenu and Kalpavriksham and fulfill all your material and worldly desires. The weight of the statue is around 825gm without packaging and its height and width is 8 inch and 5.6 inch approximately. You will receive the energized Kalpavriksham with Kamadhenu statue along with the sacred grey ash powder and Kum-Kum (Red Vermillion Powder) which was blessed in the rituals. Keep this on your meditation altar and wear on your forehead during meditation or other times and expand the Divine blessings into your life. Please Note: Your energized Kalpavriksham with Kamadhenu statue and prasad will be shipped from Chennai, Tamil Nadu. Please allow 2 – 4 weeks for delivery after the rituals. Lakshmi is an embodiment of wealth, prosperity, beauty and purity. Energies of Lakshmi invoked through an individual fire ritual performed on Gho Ashtami will be very auspicious. The Goddess holds complete sway over material wealth of every kind. The individual fire ritual will be performed at the AstroVed fire lab and remedy center in Chennai. Please Note:Your prasad will be shipped from Chennai, Tamil Nadu. Please allow 2 – 4 weeks for delivery after the entire set of rituals are performed. Note: Please allow 7-10 working days for delivery of the Report. Participate in the essential rituals for Gho Ashtami. Cow is a sacred animal. Feeding cows and offering prayers to Cow on November 19th will help you receive the blessings of the divine cow, Kamadhenu. She has the power to grant you anything you desire. 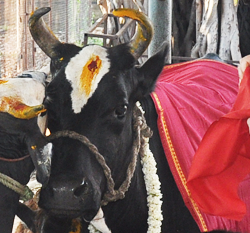 The cow and her calf are first bathed, dressed and decorated and then only the pooja is offered. The cow is the symbol of love and ever giving and is the symbolic of the Planet Venus. Participate in the enhanced rituals for Gho Ashtami. An archana to Goddess Lakshmi will be performed at her powerspot on Nov 19th (IST). A group fire ritual to Goddess kamadhenu will be performed at the AstroVed fire lab and remedy center in Chennai. Feeding cows and offering prayers to Cow on November 19th will help you receive the blessings of the divine cow, Kamadhenu, who can fulfill all your desires. You will receive the energized Laminated Picture of Divine Cow along with sacred grey ash powder and kum-kum (Red Vermillion Powder), which will be blessed in the rituals. Keep this on your meditation altar and wear on your forehead during meditation or other times and expand the Divine blessings into your life. Please Note:Your energized Laminated Picture of Divine Cow along with Prasad will be shipped from Chennai, Tamil Nadu. Please allow 2 – 4 weeks for delivery after the entire set of rituals is performed. Participate in the elite rituals for Gho Ashtami. An individual fire ritual to Saturn will be performed at the AstroVed fire lab and remedy center in Chennai on Gho Ashtami. An archana to Goddess Lakshmi will be performed at her powerspot on Nov 19th (IST). Cow pooja will be performed on this day. A group fire ritual to Goddess kamadhenu will be performed at the AstroVed fire lab and remedy center in Chennai. Kamadhenu is the divine cow which has all the Gods and Devas residing within her and She has the power to grant you anything you desire. Cow is a sacred animal and the Vedas reveals that by feeding cows will help you receive the blessings of the divine cow, Kamadhenu. 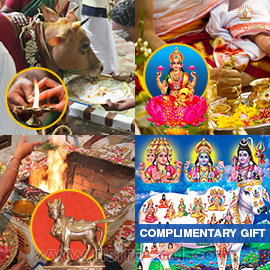 You will receive the energized Laminated Picture of Divine Cow, energized Kalpavriksham with Kamadhenu statue along with the sacred grey ash powder and kum-kum (Red Vermillion Powder), which will be blessed in the rituals. Keep this on your meditation altar and wear on your forehead during meditation or other times and expand the Divine blessings into your life. Please Note: Your energized Laminated Picture of Divine Cow, energized Kalpavriksham with Kamadhenu statue along with the Prasad will be shipped from Chennai, Tamil Nadu. Please allow 2 – 4 weeks for delivery after the entire set of rituals is performed. On this day, the Moon will be in the sign Aquarius and it will receive the great beneficial aspect of planet Jupiter. The sign Aquarius is the 11th sign of the natural zodiac representing gains, profit , fulfilment of desires, and prosperity. The lord of this 11th sign Aquarius is Saturn and saturn is placed in the sign Scorpio. This placement of the Saturn has lot of significance because the sign Scorpio represents the place where Goddess Lakshmi resides in a cow. The sign Scorpio has the birth star of Lakshmi (Anuradha) and planet Saturn is currently transiting in this star now. Worshiping Cows during this transit of Saturn will bring in the blessings of Goddess Lakshmi. The Goddess holds complete sway over material wealth of every kind. The day not just gives you wealth but also the consciousness to spend it for righteous causes. Acts of appeasing the divine energies on this day would incur immense benefit. Saturn has a unique power. If Saturn decides to bless you with wealth and prosperity, no other planet can stop Saturn. That is why there is a saying that “the wealth bestowed by Saturn is cherished for 7 generations”. Offer your prayers to Goddess Lakshmi and Cow on Gho Ashtami and receive their blessings.